16 year old Mollie Phillips worked at Rocks Farm, Exford and on the afternoon of Sunday 8th September 1929 she left her place of work to take the bus to visit her great aunt in the neighbouring Parish of Cutcombe. On that particular Sunday afternoon there was no bus running from Exford to Cutcombe. Mollie was not seen alive again. 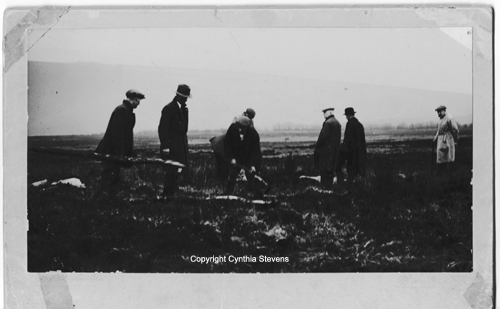 A search was started the next day followed by many more full scale searches until her body was eventually found at the end of February 1931 by Donald Grant of Hawkington Farm in a bog on Codsend Moor. Her disappearance was followed by local and national press and questions were asked in Parliament by the local MP James Lovat-Grant. Athough many local people had their suspicians regarding Mollie's death no one was ever prosecuted or really named as a suspect. Over the years much has been written about her unfortunate demise. There is a section on her disappearance in Jack Hurley's book - Murder and Mystery on Exmoor and in 2001 Birdie Johnson Sister to Boris Johnson) did a series of oral interviews including one by Ken Baker (father of Ian Baker). Ken recalled the incident and was adamant that it was murder and that he knew who commited the crime. Mollie's funeral took place at Cutcombe Parish Church and the service was conducted by the Reverend Arthur Jenoure. This area of Codsend Moor became a bit of a tourist attraction despite the nature of the land and its remoteness. The area is still remote and very boggy in places but access is now very limited because of The Right to Roam over a large part of moorland Exmoor.